Harwood grants help put safety and health information directly into the hands of vulnerable workers. OSHA is soliciting applications under the Susan Harwood Training Grant Program. A total of $4.6 million is available for nonprofit organizations, including community and faith-based organizations, employer associations, labor unions, joint labor/management associations and colleges and universities. The grant program supports hands-on training and educational programs and development of materials for workers and employers in small businesses; industries with high injury, illness and fatality rates; temporary workers and workers who are underserved, or have limited English proficiency. Funds are available through two types of grants — Targeted Topic Training and Capacity Building. Applications must be submitted electronically by June 28, 2016. For more information about the program and application process, see OSHA's list of frequently asked questions and read the news release. From May 2-6, employers, workers and safety professionals from across the country joined OSHA and partners in the National Safety Stand-Down to prevent falls. This is the third year OSHA has hosted the stand-down. More than 1,900 workers participated in a stand-down event at the construction site of the MGM Casino in Oxon Hill, Md. On Tuesday, the site of the new MGM Casino at the National Harbor in Oxon Hill, Md., dedicated time to fall prevention training and the importance of safety on such a large worksite. Whiting-Turner Construction hosted Deputy Secretary of Labor Chris Lu, Assistant Secretary Dr. David Michaels, local officials and 1,900 employees at the construction site which is expected to be complete in September 2016. In Washington, D.C., at fairgrounds near the Nationals baseball stadium, Acting Director of Construction Dean McKenzie, OSHA Regional Director Rich Mendelson and more than 650 workers stopped work on Thursday afternoon to talk about falls. The event included fall protection and rescue demonstrations, vendor exhibits and safety awards. 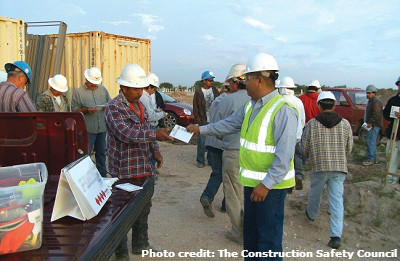 Workers participated in hundreds of stand-down events at job sites nationwide. For more information, visit the National Safety Stand-Down webpage. After receiving a report of a machinist whose blood had elevated levels of lead, OSHA inspected Brooklyn-based plumbing manufacturer, Acme Parts Inc. Inspectors found that workers lacked adequate protections against lead exposure, hearing loss and hazardous chemicals. The company was cited for nine violations and proposed fines of $105,600 for failing to: train employees on lead hazards and hazard communication; provide proper protective clothing and hearing protection; conduct monitoring to determine workers' lead exposure levels; and institute noise level controls. For more information, read the news release. The U.S. Postal Service's processing and distribution center in Sandston, Va., was cited after OSHA received a complaint. The employer was cited for violations including allowing workers to operate forklifts without using a seatbelt and operate vehicles that had not been inspected for defects after each shift. The postal service also failed to provide training to ensure workers were competent to operate equipment. OSHA proposed $120,000 in fines. The U.S. Postal Service has been cited for similar hazards each year since 2013. For more information, read the news brief. Two employers were recently cited by OSHA in unrelated incidents for failing to prevent hazards that resulted in two workers losing fingers. OSHA cited Industrial Packaging Corporation for nine safety violations and proposed $118,000 in penalties after a 23-year-old worker suffered the amputation of three fingertips while attempting to clear a jam from a machine at the corrugated cardboard manufacturer's facility in Arcadia, Wis. Inspectors determined that the injury could have been prevented if the company had trained workers in proper safety procedures to prevent the the machine's chopping blade from operating during servicing. See the news release for more information. In a similar case, OSHA cited Custom Aluminum Products in South Elgin, Ill., for two safety violations and proposed $70,000 in penalties after a 21-year-old temporary worker lost six fingers when his hands became caught in an aluminum press. Inspectors found that the incident could have been prevented if the employer had installed proper safety guards to keep the operator's hands out of the metal press' danger zone. "It's hard to imagine the agony and pain this young man suffered when six of his fingers were amputated," said Jake Scott, OSHA's area director in Aurora. "His life is now forever altered because the press lacked required safe guarding devices." See the news release for more information. A 48-year-old electrician working at Georgia Power's plant in Cartersville suffered second and third-degree burns when an arc flash occurred while he worked on an electrical cabinet that was still powered. The worker, employed by sub-contractor ABB Inc., was burned on his hands, arms and torso. 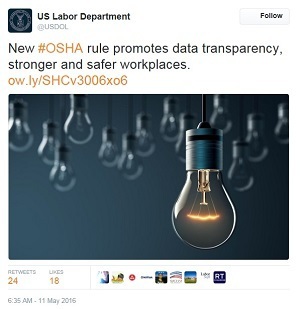 OSHA inspectors found that Georgia Power failed to: ensure proper grounding of electrical equipment; inform other employers of their electrical lockout program; and provide adequate procedures for electrical energy isolation. Georgia Power was cited for nine violations. ABB Inc. was cited for exposing workers to electrical hazards and not coordinating with other employers on requirements for removing power from equipment before maintenance. Proposed penalties totaled $122,780. Read the news brief for more information. Michigan OSHA issued $91,650 in fines to Anderson-Cook, Inc.-LM Gear after inspectors found numerous workplace safety violations at its Chesterfield facility. MIOSHA inspectors determined that the company had inadequate machine guarding; inadequate barriers around robotic machinery; allowed workers to operate overhead cranes without hardhats; and had an unguarded platform, exposing workers to falls. Inspectors also issued repeat citations for previously cited hazards that the company failed to correct. The Alaska Occupational Safety and Health Administration issued Trident Seafoods Corporation in Kodiak $134,000 in penalties for exposing workers to anhydrous ammonia and other workplace hazards. AKOSH inspectors concluded that the company failed to ensure that system emergency shutdown procedures were adequate. The inspectors also found fall hazards and a chained and padlocked exit door that could potentially trap workers during an evacuation. CSX Transportation Inc. has been ordered to pay a worker nearly $33,000 in attorney's fees and punitive damages after an OSHA investigation showed that the company violated the anti-retaliation provisions of the Federal Railroad Safety Act. Responding to a complaint, OSHA found that the Florida-based commercial rail carrier suspended a worker at the company's Selkirk, N.Y., locomotive shop after the worker notified management of numerous alleged safety hazards and FRSA violations. "This worker was clearly doing his duty, alerting management to employees' safety concerns. The company's retaliation needlessly cost him time, money and distress," said Robert Kulick, OSHA's regional administrator in New York. "As part of our findings, and in an effort to stop future violations, we are ordering CSX to have its Selkirk managers submit to training about the law and the rights it provides to their employees." For more details on this case, read the news release. For more information about workers' whistleblower rights, visit OSHA's Whistleblower Protection Programs webpage. OSHA has entered into a strategic partnership agreement with Gilbane Building Company/CG Schmidt Joint Venture, the Milwaukee Building and Construction Trades Council and AFL/CIO to protect workers during the construction of a 32-story tower in downtown Milwaukee. Goals of the partnership include promoting a cooperative relationship between labor and management and encouraging employee participation to identify, prevent and correct hazards. The partnership agreement was signed during the National Safety Stand-Down, when an evacuation drill of the entire site was held involving more than 500 participants. The White House is hosting a webinar on increasing community preparedness to extreme heat on May 26 from 2:00-3:00 p.m. EDT. During the webinar, an OSHA representative will discuss the responsibility of employers and supervisors to prevent heat illness through providing workers with water, opportunity to rest, and shade. According to the Bureau of Labor Statistics, in 2014 alone, 2,630 workers suffered from heat illness and 18 died from heat stroke and related causes. Anyone wishing to attend the webinar should register online. 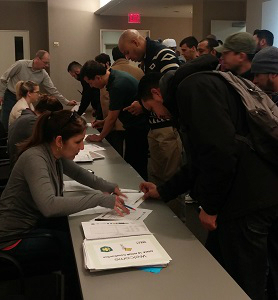 Members of community organizations helped register participants for the construction safety training event held March 23 at the New York Institute of Technology. OSHA recently held a 10-Hour Construction Training event in both English and Spanish at the New York Institute of Technology. The information provided included a focus on the four leading hazards in construction—falls, struck-by, electrical, caught-in-between—and also covered topics such as personal protective equipment and health hazards. The diverse group of participants included college engineering students, many of whom will be entering occupational safety and health careers; workers renovating homes damaged by Hurricane Sandy; and the undeserved population of immigrant Latino workers. The training was organized through a joint effort by OSHA, the American Society of Safety Engineers’ Safety Professionals for the Latino Workforce, and the ASSE Long Island and Metropolitan Chapters. QuickTakes is emailed free twice monthly to more than 135,000 subscribers. You can receive it faster and easier by subscribing to the RSS feed that delivers almost instant information. Visit OSHA's RSS Feeds Web page to subscribe.